What are Angular HTTP Interceptors and how to create them. You can find all the source code for this project here. Anything that intercepts something can be an Interceptors. 1. Before making the request server: This happens before the call is made to server. It can be used change the request configuration of HTTP call. The most common use case for this is to add an Access Token to be sent to the server with each HTTP request so that it can be validated at server end. 2. After Getting the response from server: This happens once we get the response from the server. It can be used change the response before it is being passed to the code block from where HTTP call was made. The most common use case for this is to Handle Global Error Handling across the app. If in your application, you want a common place where you can check for all the request made to server from your application and check all the responses from the server, the best way is to use “INTERCEPTORS”. We are going to build a simple Interceptor, which will intercept all the requests and responses from the server and log them into browser’s console, so that we will be able to see our interceptor in action. We are going to use an online code editor stackblitz. 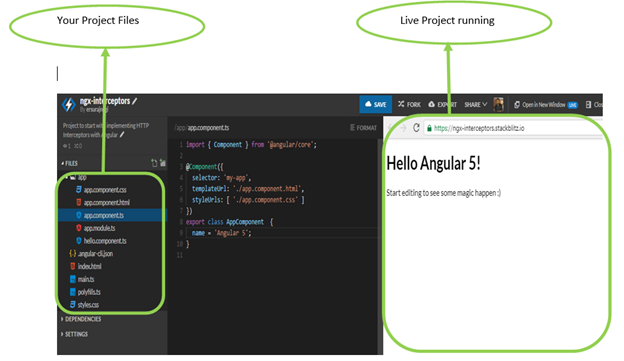 This tool will create a starter project using angular cli for you. This tool is awesome and provide so many features. For more info please go to https://stackblitz.com/ . 1. We need to Import the HttpClientModule into our application in app. 2. We need to add a Class decorated with Injector Decorator, where we will write our logic for Interceptors. 3. 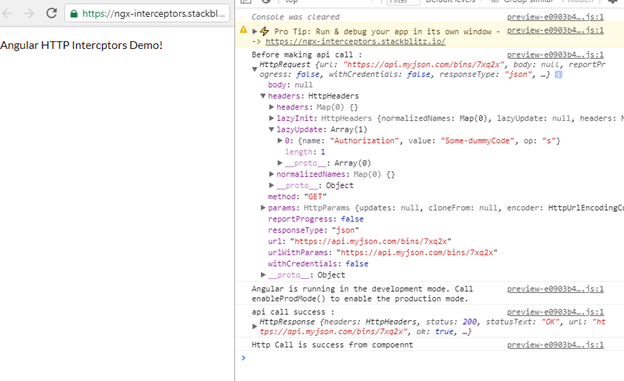 Then we need to provide information to angular to use our class from 2nd step as interceptors. Enough with the theory now, let’s do some coding now. After this, we need to add a class which will work as an interceptor for us. Let’s create a file named as my-interceptor.ts and copy the below code in it save it. I know this is a lot of code, but don’t be afraid. Let me explain the above code, then it will be clear for your guys. 3. Here we are implementing the Interceptor function provided by HttpInterceptor interface. 4. Here we are updating our request parameter by adding a header field “Authorization”. This is the main code block of our interceptor logic where we are intercepting all the request and responses. I hope now it is clear to all of you guys what we are actually doing in interceptor class. Now our code is ready. Now we just need to make some Http Calls to verify if our interceptor is working as expected or not. Let’s just modify our app.component.ts, to make some dummy http call and then check for the console to see the logs. You can find all the source code for this project here. You can play with the code and see all the messages at console. This is all about how to create and use HTTP Interceptors in Angular applications.